Color:White | Size:All-in 1 Fast Samsung Charger Kit Color:White | Size:All-in 1 Fast Samsung Charger Kit Trapid Quick Charger KitCharge QC2.0 compatible devices 4 times faster with Trapid Quick Charge 2.0 Technology than conventional charger. Compatible Devices; Samsung Galaxy Note 9 / Note 8, Galaxy S9 / S9 Plus / S8 / S8 Plus / S8 ActiveLG G7 ThinQ / G5 / G6 / G6 Pro / G6 Plus, V20 / V20S / V30, X Venture / V40 / V35Google Pixel / Pixel XL / Pixel 2 / Pixel 3 / Pixel 3XL / Pixel XL2, Nexus 5X / 6PNintendo Switch2015 Google Chromebook Pixel2015 MacBook with 12" Retina DisplaySONY XZ / XZS / XZ Premium / XZ Compact / X UltraMoto Z / Z Force / Z Play / Z2 / Z2 Force / Z2 PlayOnePlus 2 / 3 / 3T / 5Huawei Mate 10 / Mate 10 Pro / P20Lenovo Zuk Z1 / Z2 / Z2 Pro / EdgeHP Pavilion X2 / Spectre X2Nokia N1 Tablet / 9Microsoft Lumia 950 / 950 XLAsus Zen AiO / Z580C tabletXiaomi 5ZTE Axon 7And All Other Type-C devices. 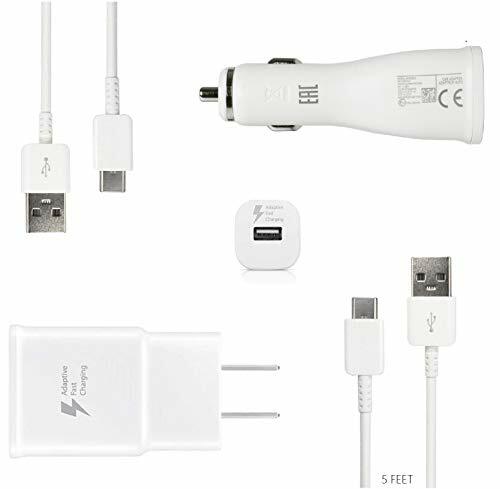 Package Include Fast Wall Charger + Fast Car Charger + 2x Type-C to USB Cables (5 Feet) - 18 Month Manufacturer Warranty - 24/7 Customer Support - Free Return-Exchange. Contact us for further details.